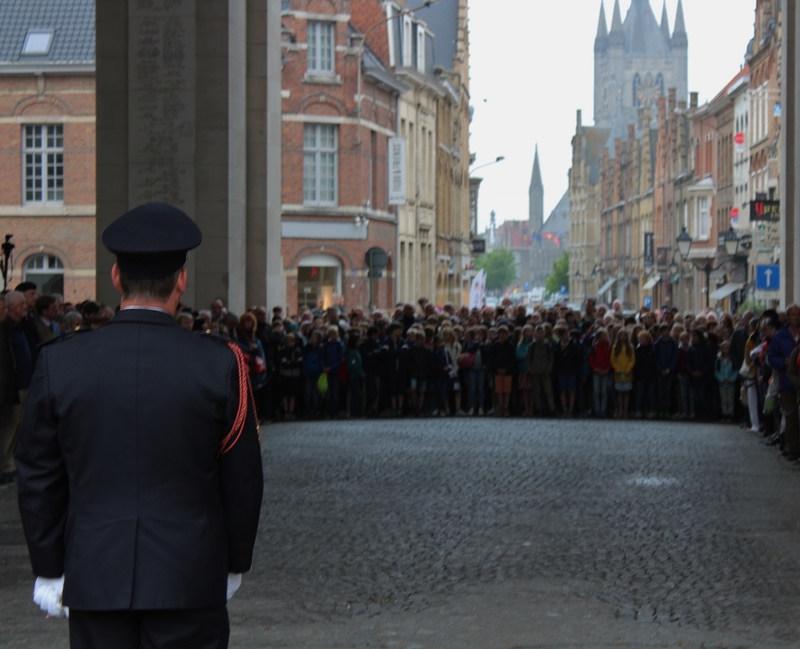 Going back a few hours, here we are awaiting the daily ceremony that has taken place at the Menin Gate, barring the years of occupation, since the end of the Great War. 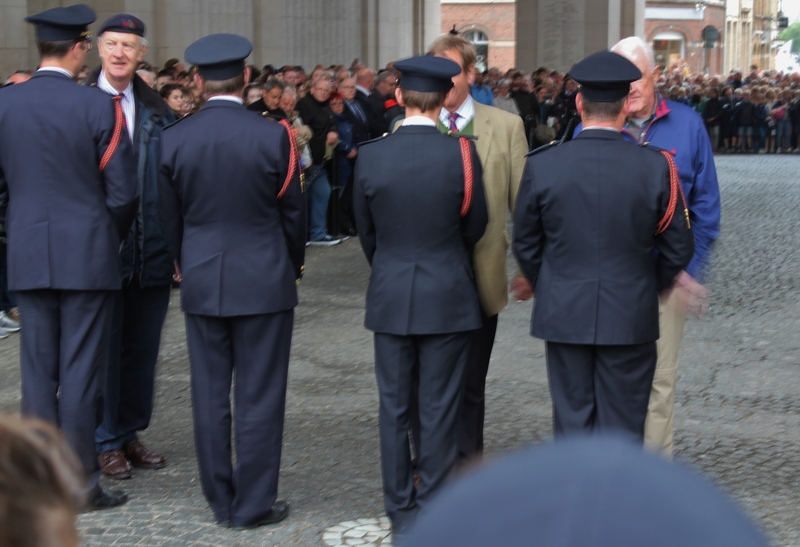 …and the wreath laying (out of shot to the right). The evening’s dignitaries shake hands and exchange a few words with the buglers – these particular dignitaries all being part of our tour group, you will encounter them again in later posts, when I shall introduce you. In the meantime, one of them left this wreath and attached note, which contains a clue. 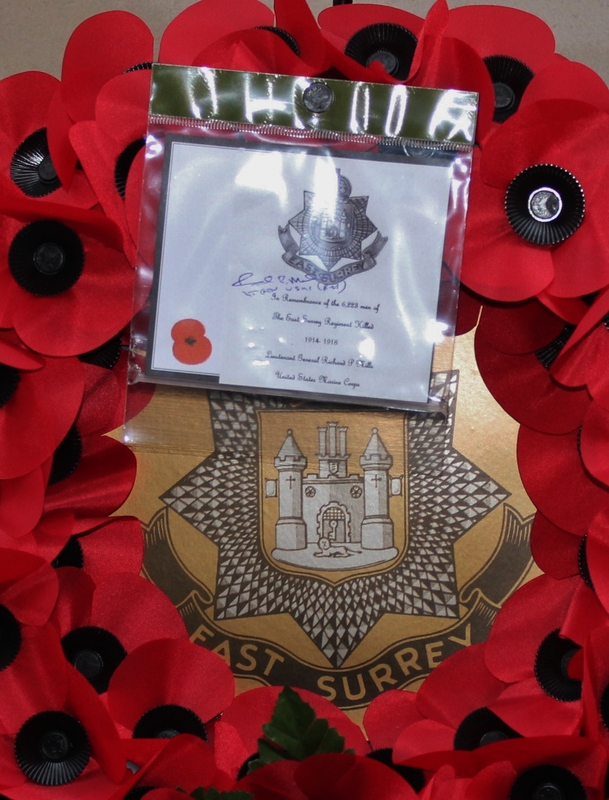 ‘In Remembrance of the 6,228 men of The East Surrey Regiment Killed 1914-1918. Lieutenant General Richard P. Mills, United States Marine Corps’. 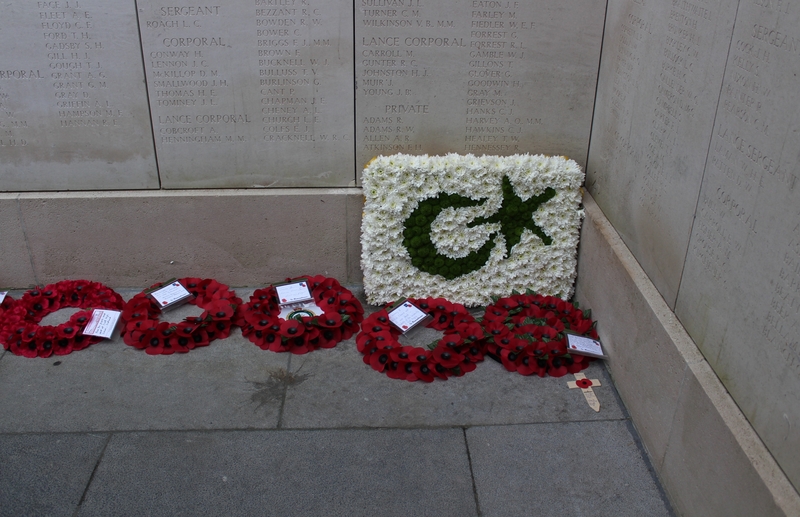 …opportunity beckoned to find some specific men among the thousands remembered here, beginning with the eight Victoria Cross holders whose names are to be found inscribed on the panels, all but one of whom died in, or soon after, the action in which they won their award. A more general, and very long, tour around the memorial can be found here. Frederick Fisher was born in Ontario, Canada, on 3rd August 1894, his family moving to Montreal in 1905. Within days of the outbreak of war he enlisted in 5th Regiment (Royal Highlanders of Canada) before being posted to 13th Battalion Canadian Expeditionary Force and arriving in England in mid-October 1914. In February 1915 the battalion arrived in France, and Fisher, now a lance corporal in the battalion Machine Gun Section, had his first experience of the trenches in the ‘Nursery’ where the Canadians took over a section of line at Fleurbaix, prior to moving to the Ypres Salient in mid-April. During the desperate defence following the first German gas attack on 22nd April, Fisher, seeing that advancing German troops were about to overrun a Canadian artillery battery, raced forward with his machine gun team and, under heavy enemy fire, covered the retreat of the battery, allowing the two 18-pound guns to be saved, although four of his men were killed. Continuing on, he cleared part of a wood of its German inhabitants, taking charge of a French machine gun that had been abandoned. 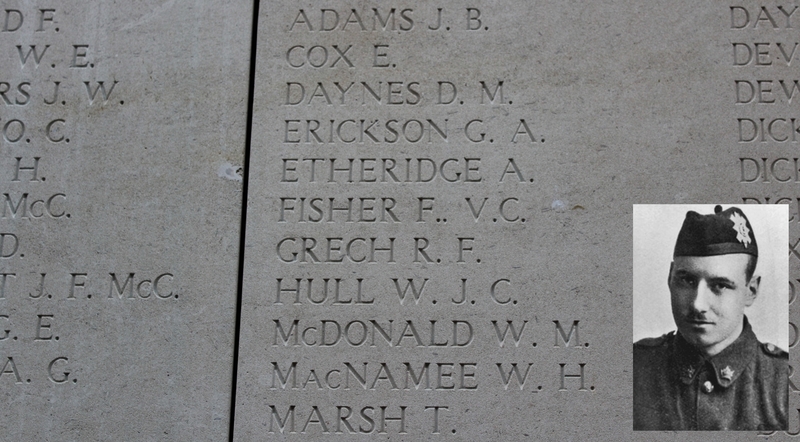 Frederick Fisher was killed in action the following day, 23rd April, when, whilst mounting his gun on the trench parapet under heavy fire, he was shot in the chest and killed. His body was buried behind the trench at the time, but was subsequently lost. A curious discrepancy exists between the date of the action in which he won his V.C., which is given officially as 23rd April, and the Official History of the Canadian Forces in the Great War 1914-1919, which gives the date of the action as the evening of 22nd April. He was the first Canadian (as in born in Canada) in the Canadian Army to be awarded the V.C. Frederick William Hall was born on 21st February 1885 in County Kilkenny, Ireland, and enlisted in the Cameronians (Scottish Rifles) Special Reserve in February 1901. Over the next twelve years he served in both South Africa and India before returning to England and leaving the service with the rank of sergeant in 1913, after which he emigrated to Canada. Joining the 8th Battalion (Winnipeg Rifles) in September 1914 and embarking with them for England in October, by December Frederick was a Colour Sergeant, and in mid-February the battalion arrived in France where, after further training, they entered the line in mid-April, taking over French positions a few days before the German gas attack of 22nd April. On the night of 23rd Frederick Hall, hearing moaning from wounded men on a nearby ridge, twice went out under cover of darkness to help, returning on both occasions with a wounded man. As dawn broke on 24th April, and with some men still missing, Hall and two others went out under heavy enemy fire to conduct a search for them. His two colleagues were soon hit and returned to the British lines, but Hall continued to try to help a wounded man calling for help nearby, reaching him at the second attempt, and it was whilst trying to lift the man to carry him back that both men were shot and killed. Edward Warner was born on 18th November 1883 in Hertfordshire. He enlisted in the Bedfordshire Regiment late in 1903, serving in India until the battalion returned to England, where he joined the reserve. Recalled immediately on the outbreak of war, he was in France by 16th August 1914. On 1st May 1915, near Hill 60, Warner, acting on his own initiative, entered a recently gassed and vacated British trench alone to prevent it from falling into German hands. Despite being seriously gassed, and with reinforcements unable to reach him, he held out before leaving the trench to bring more men up himself, after which he collapsed. The trench was held, but Private Edward Warner died soon afterwards from the effects of the German gas. His body, as was the case with so many who fought and died on Hill 60, was later lost. Sidney Clayton Woodroffe was born on 7th December 1895 near Lewes, East Sussex. Commissioned into the Rifle Brigade on 23rd December 1914, he embarked for France at the end of May 1915. On 30th July 1915, at Hooge on the Menin Road, as the Germans succeeded in breaking through the centre of the British front line trenches using flame throwers, Second Lieutenant Woodroffe’s position came under heavy attack from bombers on both flanks, and from the rear. Woodroffe defended his post until his supply of bombs was exhausted, after which he managed to extract his remaining men from the position, before immediately leading them on a counter attack under severe rifle and machine gun fire, during which he was killed whilst attempting to cut through the German wire. 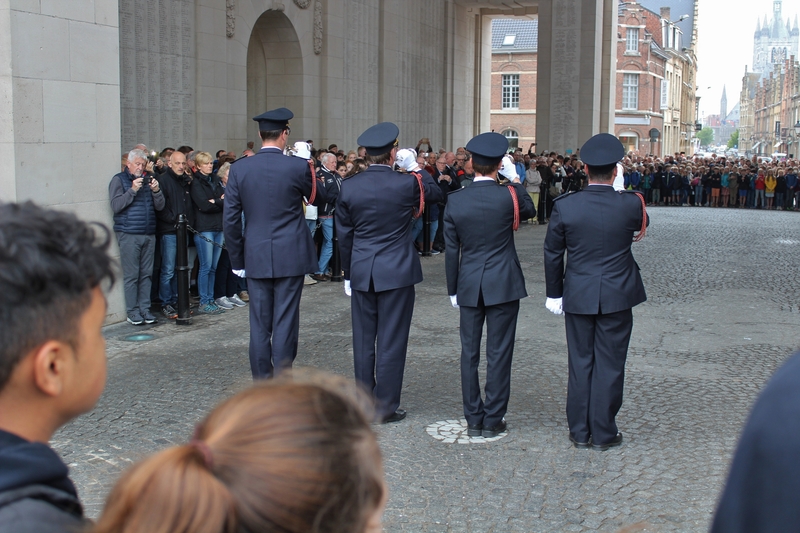 As an interesting postscript, Lieutenant Gilbert Talbot, after which Talbot House in Poperinghe would be named, was also killed at the same place on the same day. 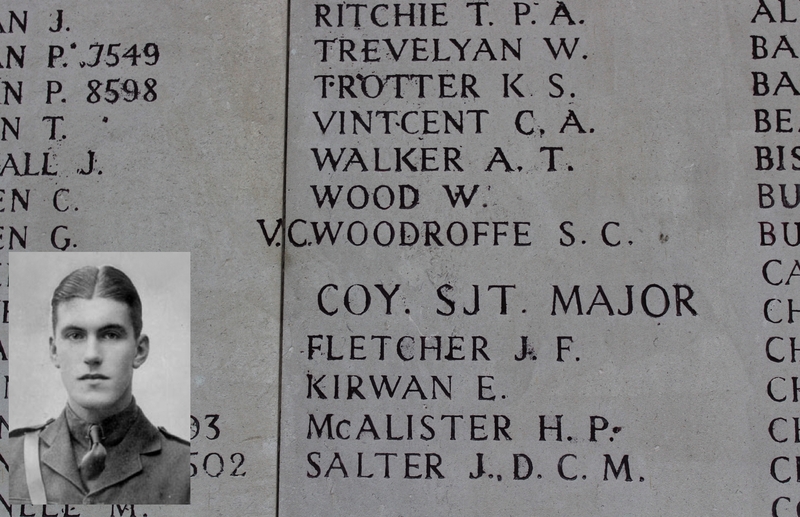 His brother, Neville Talbot, crawled into No Man’s Land and identified not only his brothers’ body, but also that of Sidney Woodroffe. 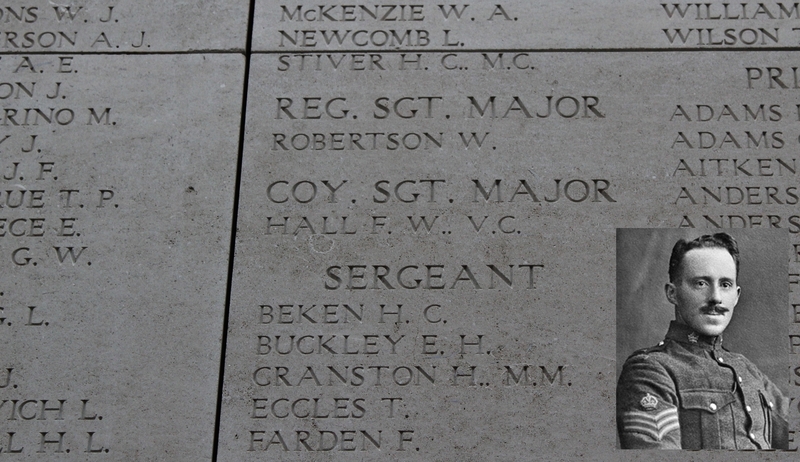 A week later Gilbert Talbot’s body was retrieved (we have visited his grave in Sanctuary Wood Cemetery), but Sidney’s body could not be found. 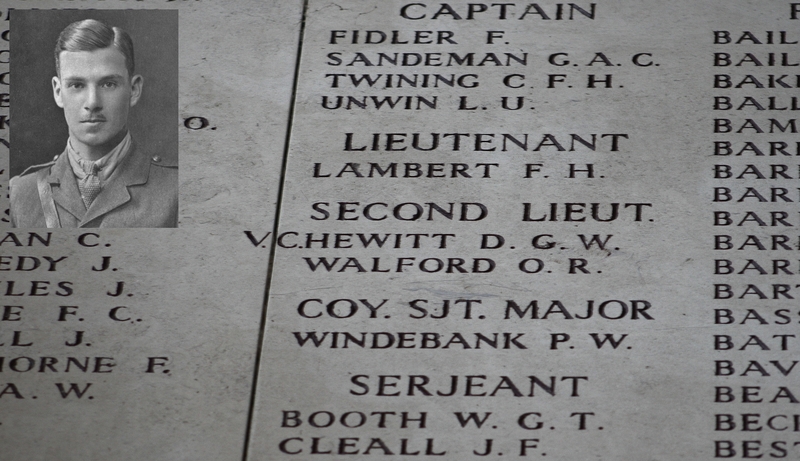 Sidney Woodroffe was the first member of the New Armies to be awarded a Victoria Cross. Two V.C.s on one panel, if you can spot them. 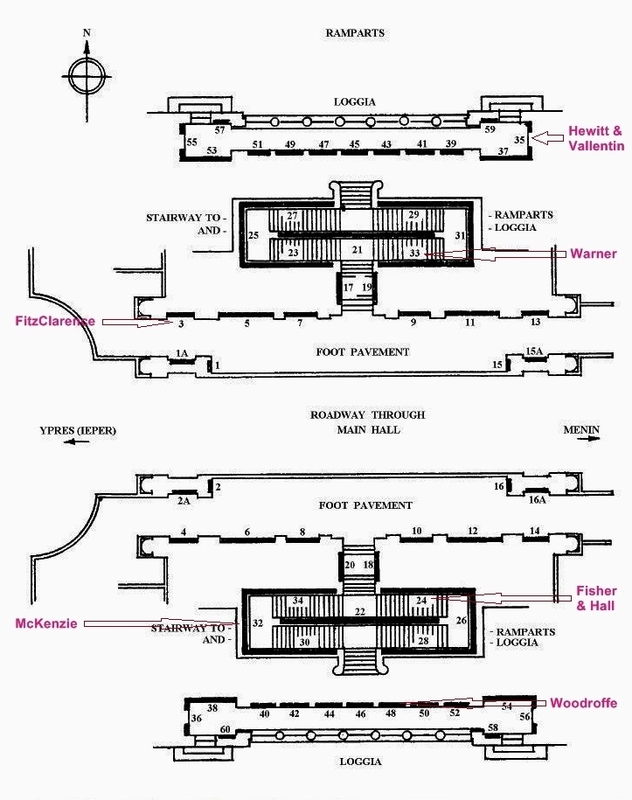 John Franks Vallentin was born in Lambeth in London on 14th May 1882. Early in his Army career he served in South Africa with the Royal Sussex Regiment, later gaining a regular commission in the Royal Garrison Artillery before transferring to the South Staffordshire Regiment in 1905 and serving on the North West Frontier of India. Promoted to captain in 1909, he arrived in France with his battalion on 5th October 1914, and although slightly wounded at the end of the month, was soon back in the front line. On 7th November 1914, near Zillebeke, John Vallentin was leading an attack under heavy German fire when he was severely wounded and, on rising to encourage his men to continue the attack, killed. Denis George Wyldbore Hewitt was born in Mayfair in London on 18th December 1897. He was commissioned into the Hampshire Regiment in April 1916, and by September he was in France. On 31st July 1917, north east of Ieper, his men having captured their first objective, and whilst waiting for the barrage to lift in order to advance once more, he was hit by a shell fragment which exploded the signal lights in his haversack, setting fire to his equipment and clothes. Despite being wounded and in severe pain from his burns, Hewitt led forward the remains of his company under heavy German machine gun fire, capturing their second objective. It was while inspecting the consolidation of the captured position that he was killed by a sniper. Although the location of his grave was recorded as 150 yards west of the St Julien to Poelcapelle road, his body was never subsequently found. Hugh McDonald McKenzie was born in Liverpool on 5th December 1885, emigrating to Canada with his wife and family in 1911. On the outbreak of war Hugh enlisted in Princess Patricia’s Canadian Light Infantry, sailing for England with the First Canadian Contingent on 3rd October, before embarking for France on 20th December. In May 1915 he was awarded both the D.C.M. & the Croix de Guerre for his actions as part of a machine gun team on the Bellewaarde Ridge. Transferring to 7th Canadian Machine Gun Company on 3rd September 1916 as an acting Company Sergeant Major, he would return to PPCLI in January 1917 as a temporary lieutenant. On 30th October 1917, near Passchendaele, Hugh McKenzie, in charge of a section of four machine guns supporting an attack by the PPCLI, became aware that the troops of the nearest infantry company, having lost all its officers and most of its NCOs, were pinned down in the face of fire from a strongpoint containing several German machine guns. McKenzie, taking charge of the infantry, proceeded to capture the strongpoint, which was itself covered by more machine guns sited in a nearby bunker. 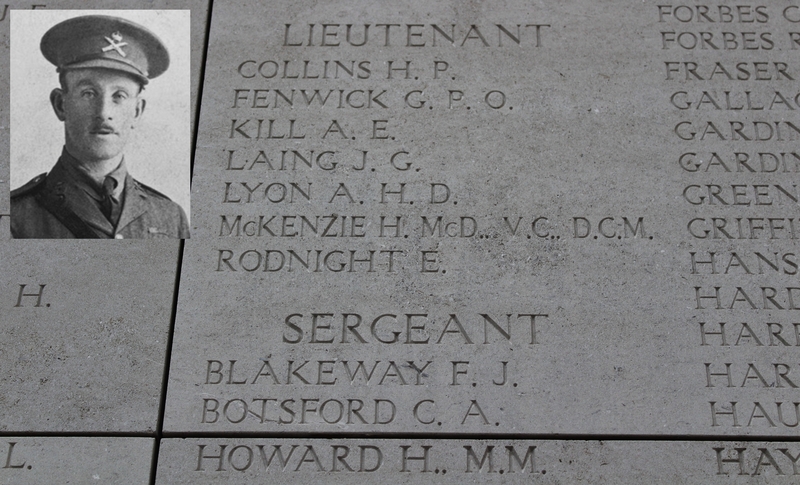 Realising that the bunker could prove a serious obstacle the next part of the advance, he organised a frontal and flanking assault to capture it, and it was whilst leading the frontal, ultimately successful, attack, that Hugh McKenzie was killed. 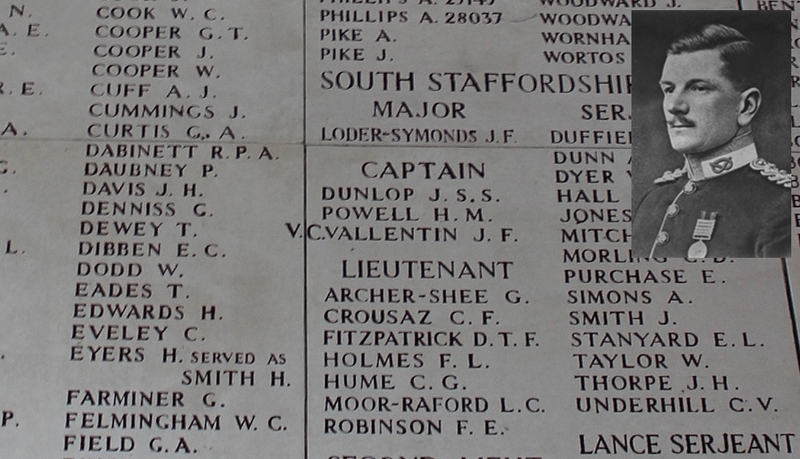 And last but not least, the only man on the Menin Gate who was awarded a V.C. 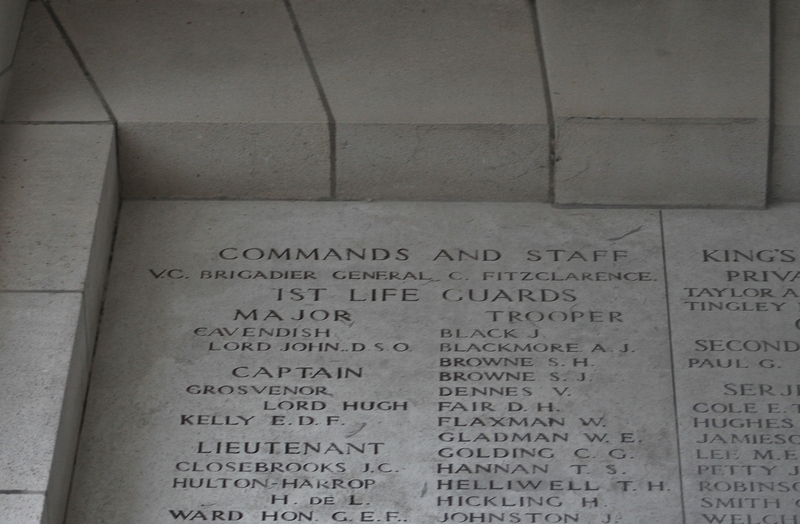 in a conflict other than the Great War, and the highest ranking officer among the 54,000 plus names on the memorial, hence his being referred to, by fellow servicemen, as G.O.C. 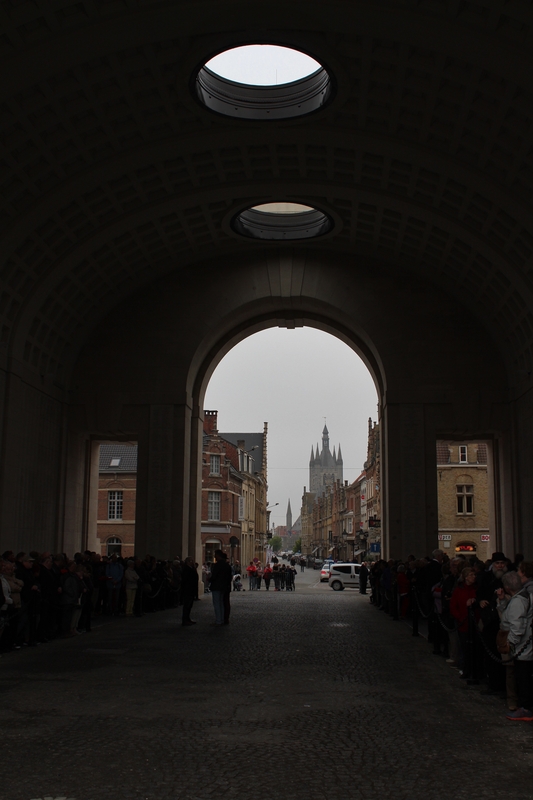 Menin Gate. Charles FitzClarence was born on 8th May 1865 in County Kildare, Ireland, the son of a navy captain (his paternal grandfather was George FitzClarence, 1st Earl of Munster, an illegitimate son of William, Duke of Clarence, himself later King William IV). Educated at Eton and Wellington College, an army career beckoned, initially, in November 1866, as a lieutenant in the Royal Fusiliers. He participated, as Adjutant of the Mounted Infantry, in Kitchener’s Egyptian campaign, and was promoted to captain in 1898 before being sent to South Africa the following year. It was during the siege of Mafeking, at which time his bravery and fighting spirit earned him the epithet ‘The Demon’, that FitzClarence was awarded the V.C. for three separate acts of heroism. On the 14th October, 1899, whilst besieged at Mafeking, he led his squadron of the Protectorate Regiment, many of whom were only partly trained and had never before been in action, to the assistance of an armoured train that had set out from Mafeking before encountering a large force of Boer troops. Despite greatly inferior numbers, and at times being surrounded, FitzClarence and his men not only managed to relieve the train, but inflicted such serious casualties on the Boers, of whom some fifty were killed, that Boer tactics would change as a result of this action. 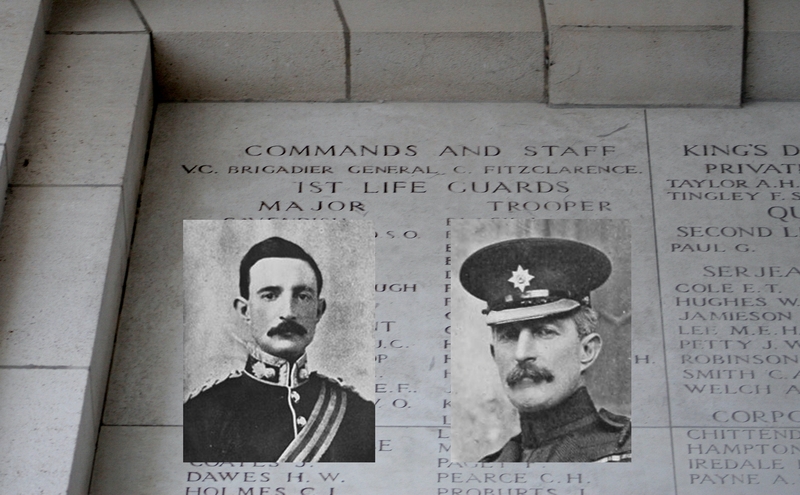 Two weeks later, on 27th October, FitzClarence led his men out on a night bayonet attack on the Boer trenches. The first man to reach the enemy position, he personally killed four Boers with his sword, receiving a slight wound for his troubles, as the Boers were driven out with heavy losses. On 26th December, during the action at Game Tree, near Mafeking, he once more showed great courage and coolness under fire despite being once again wounded, this time severely, in both legs. He was presented with his Victoria Cross in October 1900 by another V.C. recipient, the Commander-in-Chief South Africa, Lord Frederick Roberts. Returning to England and transferring to the newly formed Irish Guards, he was promoted to Brigade Major and, in 1909, given command of 1st Battalion, Irish Guards, followed by command of the regiment in 1913. During the First Battle of Ypres, he took over command of 1st Guards Brigade in France from General Ivor Maxse, playing a major role in organising and leading the counterattack that restored the line at Gheluvelt at the end of October, and attempting likewise when his depleted brigade were attacked by a regiment of Prussian Guards on 11th November 1914 during the Battle of Nonne Bosschen, just to the west of Polygon Wood, the final German attempt to break the British lines during the last days of First Ypres. Forced out of their front line, FitzClarence reorganised his men and halted the advance, and, determined to retake the lost trenches, returned to the rear to find men to replace his losses and launch a counterattack. He was leading five hundred Grenadier & Irish Guards, along with some Royal Munster Fusiliers he had conscripted, back to the front lines when he was shot and killed by a German sniper. His planned counterattack never took place. 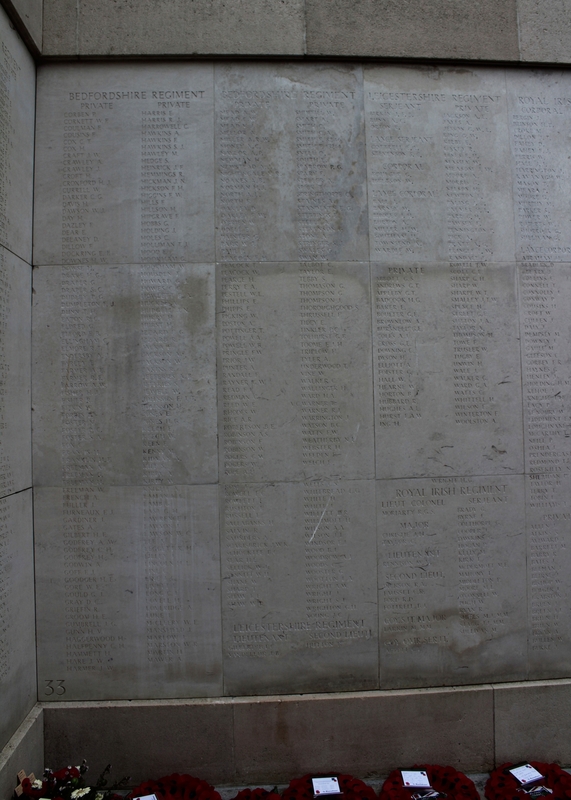 And to save you a lot of time should you ever visit the Menin Gate and wish to pay your respects to these eight men, here are the panels on which their names are to be found; if you’re wondering why I haven’t mentioned the official panel numbers it’s because, quite frankly, they are sometimes more confusing than helpful. 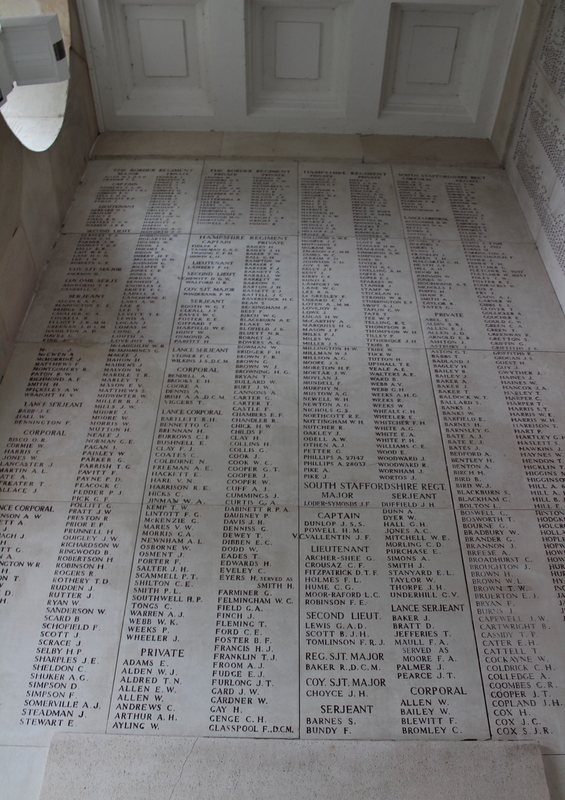 There are currently 54,613 names, according to the CWGC database, on the Menin Gate. Remember them. Awesome post! Thank you for including these individual stories and photos. Really fabulous work you’re doing. Thank you Andrew. Very much appreciated. 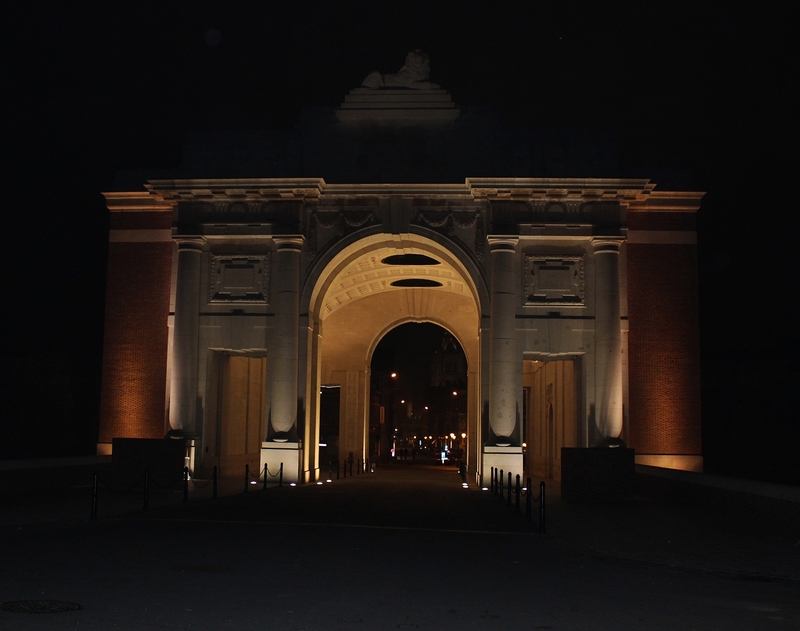 I’m visiting Menin Gate tomorrow evening with some 40 pupils – yet something more to talk about – thx! Excellent stuff – and there’s more to come soon for your next visit. Another excellent and informative post which is supported by hours of meticulous research no doubt. 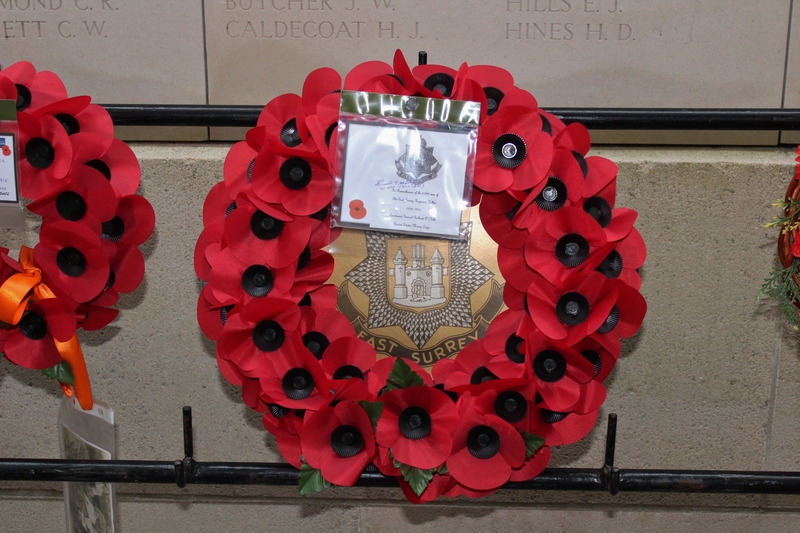 I am intrigued by why Lieutenant General Richard P. Mills, United States Marine Corps should leave a wreath in memory of the East Surreys (which, as you Magicfingers I have a special interest, mainly the Shiny Twelfth)? and his grandfather fought for the East Surreys during the Great War. Thus he was on our tour, and an interesting chap he is too, as you might imagine. I have a question for you – has U534 been completely restored now? In 2007 U534 was acquired from the Receiver of the Warship Preservation Trust by the Merseytravel Transit Authority who have completely, totally, utterly destroyed it in an act of mindless vandalism. They cut it up into 5 sections to ‘allow visitors better visibility without entering the vessel’!! However the real reason was solely down to cost – and crass decision making by people who know nothing and care little about history. It was significantly cheaper to move the boat in sections on small barges a couple of km along the Mersey to the Woodside Ferry Terminal where the bits now lie. Apart from U-995 at the Laboe Naval Memorial, Germany, U534 was the last intact Type V11C and to cut her up has destroyed this important piece of history. It still angers me to think about it but I know how privileged I was to visit U534 when it was still at Birkenhead. That is an outrageous story! What a terrible shame. Such actions are beyond belief. I shan’t be making that trip then. 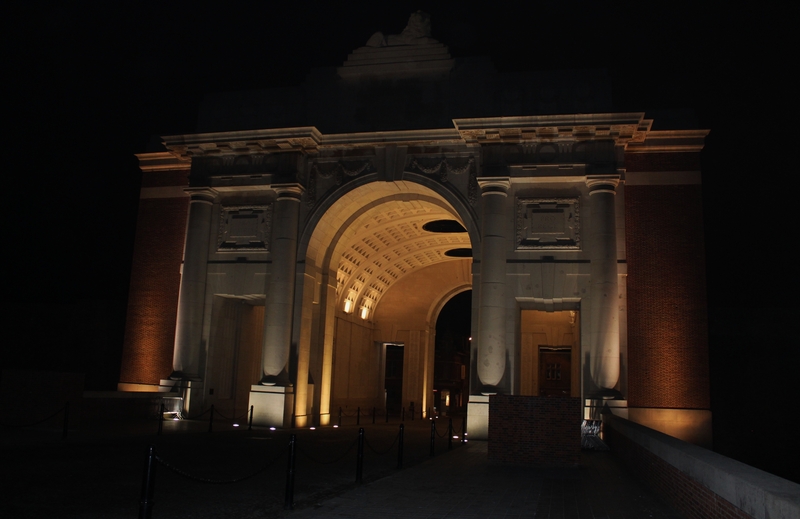 I’ve visited the Ieper area several times (as my main interests are cycling, beer and WW1 history where better to go!). I recently discovered your site and must compliment you on the amount of work you’ve put into it. I normally stay in Dranouter and I had a nice ride last week from there up to Passendale via Wijtschate, Geluveld, Zonnebeke and Polygon Wood. You’re probably aware of this but some reading this might not be – there is an interesting exhibition in the tourist info office in Kemmel and also one in the nearby church mainly about Irish Division and William Redmond. Hi Iain. You weren’t that bloke very late at night on the Wieltje road we saw weaving his bike around the road with what looked suspiciously like a couple of silent pickets poking out of his haversack, were you? I’m sorry. I jest, of course. Thanks for being kind about my site, and if you do find it of interest, you have a lot of catching up to do! Anything and everything gets updated here. Thanks for the Kemmel info too – I don’t think I was aware of the exhibition, and I have a date with the Kemmelberg later in the year. I shall have to hope it is still on when I’m there. Anyway, it’s not all about me – as you say, others will now be aware. Given the strength of Belgian beer that could well have been me, don’t remember the silent pickets though!! Without wishing to poke my nose in too much, the following is an interesting and moving exhibition, being dismantled on 11 Nov I believe. I was at or very near the Palingbeek the other week and have only found out about the memorial ‘artwork’ and egg since, funnily enough. Hopefully I shall get to Kemmel before 11th November. Nose poking perfectly acceptable here. The exhibition shows the incredible number of the 600,000 persons that died in Belgium during WW1 (soldiers as well as civilians). As many sculptures have been made all over the country out of clay, baked and are now placed in what was no man’s land between German and British lines (the hedges on both sides mark the exact spot where they were) close to the Bluff. 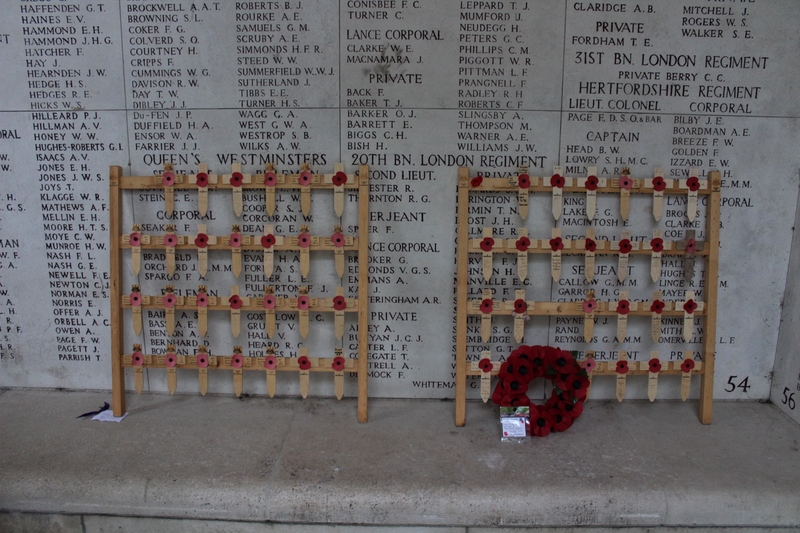 Look for http://www.inflandersfields.be/en/namelist and you’ll be able to see who died exactly on what day during WW1. …although to be fair, now that I think about it, you mentioned it to me some years ago, I believe, Filip, when it was being developed, and I have just put two and two together and realised this is what you were referring to.